Okay, lately I have become absolutely addicted to Craigslist Free Stuff. Not because I need a dirty mop (yes, I have seen this posted) or am looking for any item in particular (but if I did need a piano or bulky television, I would know where to look), but because some of the items and explanations which go along with them fascinate me. It makes me wonder what the backstory is behind the item put up for grabs or the sometimes elaborate explanation which accompanies it. So, for this week’s Writing Workshop Wednesdays, I am posting a picture of an actual FREE item from Craigslist. PROMPT: Explain this couch’s backstory. 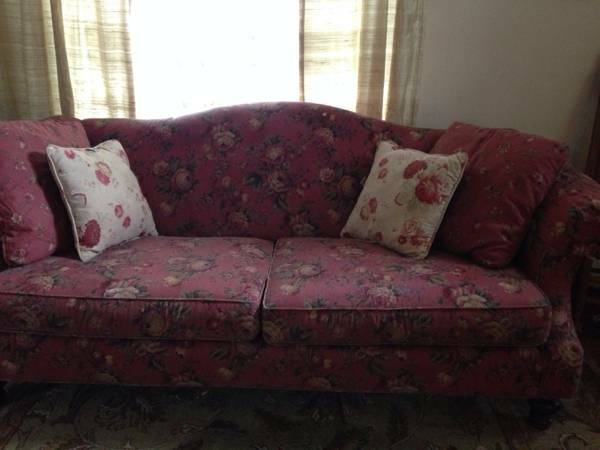 Who bought this couch, and why? What memories involve this couch? A first kiss? Deep discussions? What can you infer from the fabric, style, and wear? Why is the couch being abandoned now?